A play staged by Moscow’s Theater of Nations has become the first theatrical production in Russia to feature both deaf-blind and sighted and hearing actors alongside each other on the same stage. RBTH correspondent Olesya Khantsevich attended a recent performance of ‘The Touchables’ and spoke to some of the participants. An unusual play recently opened at Moscow's Theater of Nations. Dubbed “The Touchables: A Life in Art,” the production represents not only the first social theater effort undertaken in Russia, but also the first ever theatrical piece which involves deaf-blind people performing beside sighted and hearing actors. 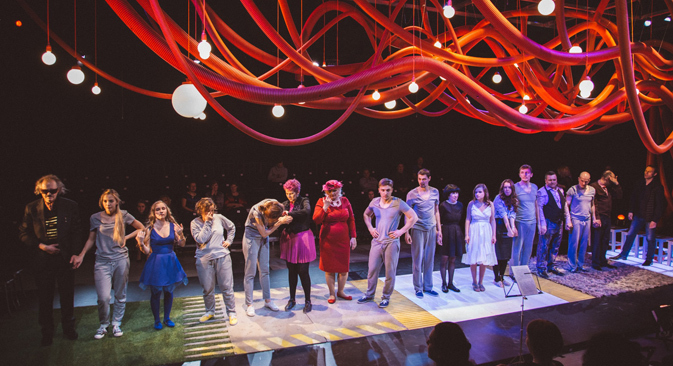 The play offers a phenomenal cultural experience, both to disabled people and ordinary audiences alike. “The Touchables” ìs an attempt to build bridges between two worlds, to establish communication with the stage as the medium. This idea governs everything, including the set design – the performance takes place on a large catwalk in the center of the hall, with spectator seats placed on both sides of it. Regardless, the will to live and to improve oneself demonstrated by these actors who are both hearing and visually impaired is nothing short of striking. The protagonists of the play have managed not only to fulfill themselves and find love, but also to build successful careers: The participants of the production include a university professor with a PhD in psychology, an editor of a magazine for the deaf-blind, a poet, a writer, a sculptor, a milling machine operator and a seamstress. Ingeborga Dapkunaite, who plays the part of the narrator, tells the touching story of the late Olga Skorokhodova, the only deaf-blind person in the Soviet Union to become a speech pathologist, as well as a professor, a literary artist and a poet. “People are different. We have different abilities. And we often ignore those who differ from us. This is our ignorance. This performance is our attempt to get to know each other,” says Dapkunaite. After “The Touchables,” the actress, who is involved in many charity projects, became the producer for a similar production of the Russian deaf-blind support foundation So-Yedinenie (“Connection”). The idea behind “The Touchables” was first voiced a year ago by Yevgeny Mironov, artistic director of the Theater of Nations, at a meeting of the board of trustees of So-Yedinenie. It was inspired by the Israeli Nalaagat Theater Ensemble – a troupe from Tel-Aviv made up solely of deaf-blind performers. While the completely disarmed spectators try to hide their tears meeting the previously unknown world of “The Touchables,” the protagonists are also gaining an unforgettable experience: They express themselves in pantomime, they dance, they listen to the songs performed by the actors by touching their throat, they run around holding hands with their counterparts, they smile. After the performance, there is long and loud “applause” – the spectators tap their feet on the wooden floor to transmit their admiration and gratitude through vibrations. This is well-deserved, as “The Touchables” not only shows ordinary people what it is like to sense the world only through touch and smell, but also helps them to see themselves in a different light.